Common Location: At the top of the mountains. Wild: Quetzalcoatlus is one of the largest avians on the island. It shares a similar silhouette with the Pteranodon, and nests near the absolute highest peaks. Upon closer inspection, though, Quetzalcoatlus is an enormous creature of tremendous power. Domesticated: Tamed Quetzalcoatlus have a very specific role on the island. Too slow to be an efficient local transport, and too weak to be an effective warbird, the tribes I have encountered tend to employ it as a mass carrier. 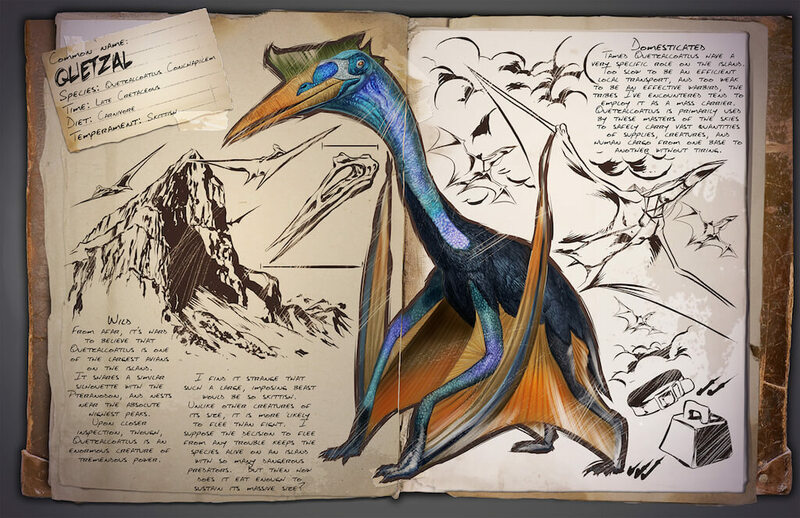 Quetzalcoatlus is primarily used by these masters of the skies to safely carry vast quantities of supplies, creatures and human cargo from one base to another without tiring. Known Information: I find it strange that such a large, imposing beast would be so skittish. Unlike other creatures of its size, it is more likely to flee than fight. I suppose the decision to flee from any trouble keeps the species alive on an island with so many dangerous predators. But then how does it eat enough to sustain its massive size? Since the Quetzal will be able to carry a lot of weight, it can mainly be used as a flying carrier (like a flying bronto). Furthermore, there is a platform saddle available, which means that it will be even possible to create a mobile flying base! For what purposes will you use this flying tanker? Just a forge to fly to the mountains with and return with massive amounts of iron ingots, or will you use it in PvP to fly even the biggest dinosaurs to the bases of the enemy? Leave your ideas in the comments below!